LG G3 Stylus is LG’s another release under their G3 badging after G3 Beat and Vista, They all share the same design lineage from LG G3, and the similarity ends there, and the specification for these device is no match with the flagship LG G3. But it’s reassuring to see this smartphone as it houses a larger display, features and stylus, at lower price range. As mentioned earlier the design is the same as the LG G3 with 5.5 inch qHD screen, tapered edges, brushed metal finish and thin bezel. The phone is bundled with Rubidium Stylus pen, the OS is pen enabled and allows accurate jotting, doodling, and sketching. LG tried to pack almost all the features of G3 in this one also. The 13 MP camera is one example as it carries features like Touch and shoot, Gesture Shot, and front camera light straight from G3. Another example is its 3000 mAh battery, which though is expected to outperform in this device compared to LG G3, as the specification in this one is not so aggressive and power hungry like in G3. Other features in LG G3 Stylus include QuickMemo+, for capturing Memo, text and its easy sharing, Multitasking via Dual Window, Smart Keyboard for accurate typing, focus and shoot by tapping anywhere in the touchscreen with Touch and Shoot, Gesture shot to enable 3 second selfie timer and finally the Knock Code for unlocking the smartphone with double tap or with customized tap pattern. Coming to its specifications, it is no way near LG G3 and with these specifications it’s going to be really hard for it to compete with others in the crowded segment it is going to get placed, unless LG price it aggressively. It has a Quad Code CPU clocked at 1.3 GHz and 2 GB of RAM, there is microSD slot and also 8 GB inbuilt storage. The 5.5 inch qHD IPS screen is large but with 960 x 540 resolution it is not expected to give a better experience. There is a 1.3 MP camera for selfie addicts apart from its 13MP primary camera. It runs on Android 4.4.2 Kitkat. LG G3 Stylus is a bit heavier than G3 at 163 grams the extra weight must be from the stylus. It lacks 4G LTE and there is only 3G network option. The phone comes in black, white, and golden color. This device is marketed with the bundled Stylus Pen as its USP. 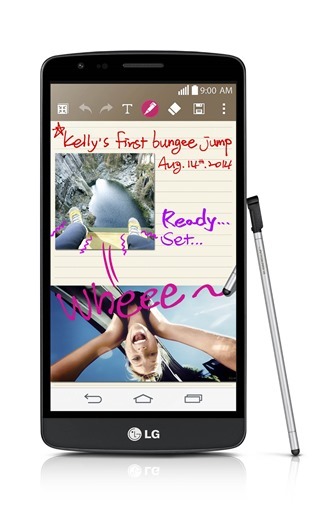 LG G3 Stylus starts its shipping in Brazil by this September and later in Asia, Middle East, Africa and CIS. The pricing is not yet revealed and only be announced along with their regional launch.